Not a lot of stuff comes in groups of 5. You have the Olympic rings, fingers on each hand and toes on each feet, the points on a star and the number of players on a basketball team. But really, not a lot comes grouped five at a time. Ten hotdogs, eight buns, Three Stooges, twelve eggs, four tires on a car, and six beers. Lucky number 7, nine players on a baseball team, eleven on a football/soccer team and a pair of shoes. And just three of us. Or is it six? So let's celebrate the number five with five images from five mailings I received from 5 different people. First up, Jaybarkerfan clone Matt from Bob Walk the Plank. Matt sent me just two cards, but oh what two cards they are. I believe Kit's auto is from the 2013 Archives. Maybe 2012. 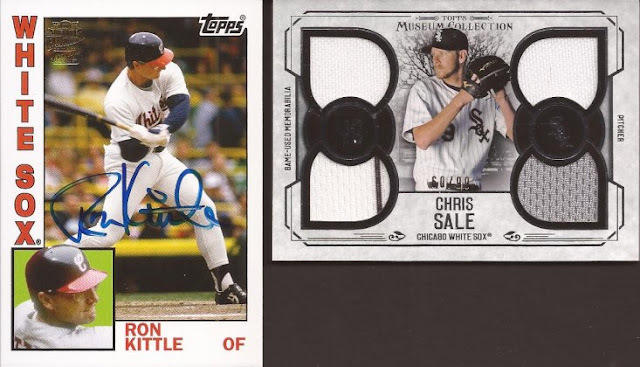 And that gorgeous Sale Museum card is #/99. Again, I will not become a Sale supper collector. That being said - send me all your Chris Sale cards. Thanks Matt. Hockey could be anyone. But hockey vintage points to one thing, a Holye-ing from Mark. 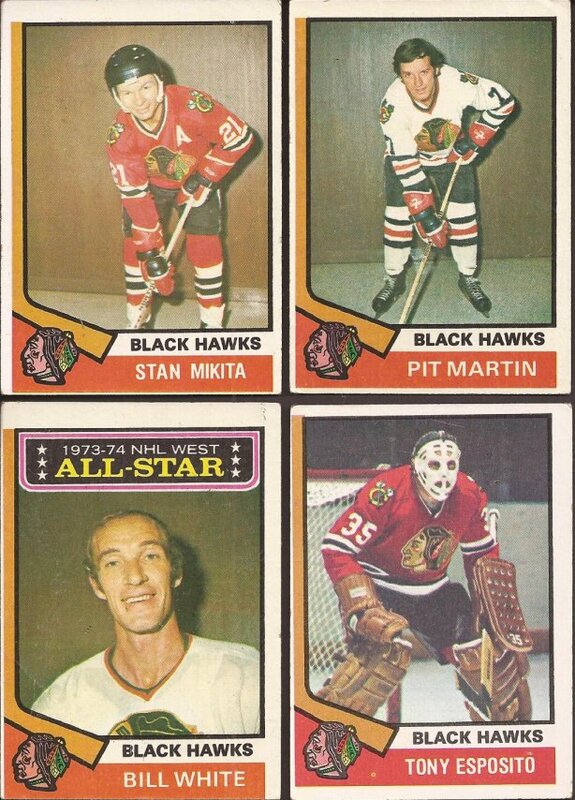 These 4 cards bring my total of 74-75 Blackhawks cards to 4. Yup - first ones in the Hawks box. Appreciate the vintage, Mark. Waiting 'til Next Year Tom dropped a PWE of bunts on me. 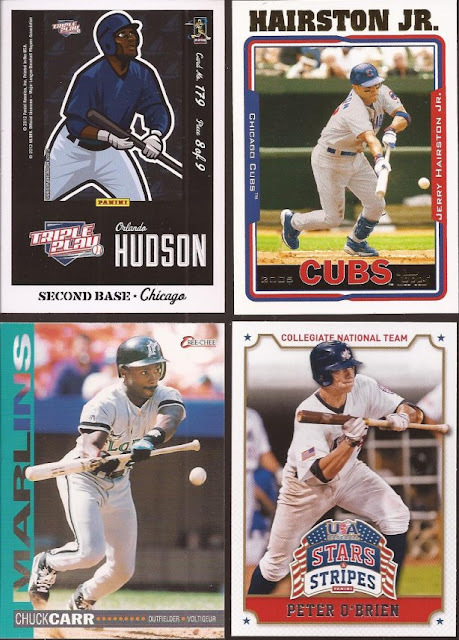 I week or so back I talked about that Hudson card. I had 7 cards of the puzzle. Tom just dropped #8, and I received #9 a couple days ago (future post). So that is done. Thanks again, Tom. The Junior Junkie TJ dropped this single Golden Age panel on me with a note there is more to come. TJ pulled it damaged (dig that crease through Christy's legs, but I love anything Golden Age. Love this in my binders. Not sure if I should be glad or scared there is more coming, TJ. Started with two cards, and we'll end it that way, courtesy of Robert at $30 a Week Habit. The note enclosed read "I am glad someone else appreciates the 1964 set". I do, and I thank you for another card closer to completing the set (just under 50%). While I don't like this years Heritage, who am I to turn down a refractor insert? Robert is a bit out of commission on his blog. Come back soon! Ok - so there is a good group of 5, all from the generosity of 5 different readers. 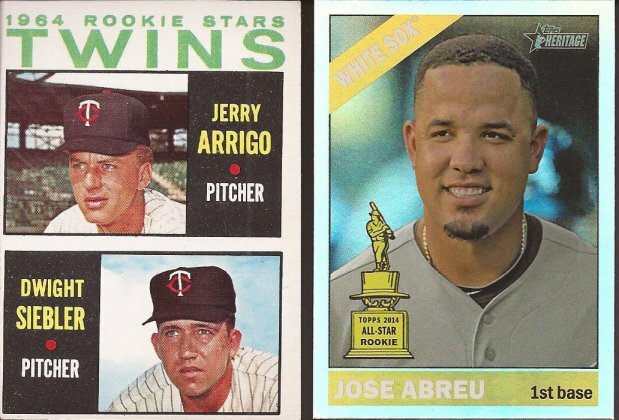 I like the 4 x relic cards. Card Papoy just sent the Polanco to me. Glad you liked the cards. I'll have to find a few more vintage Hawks for you.